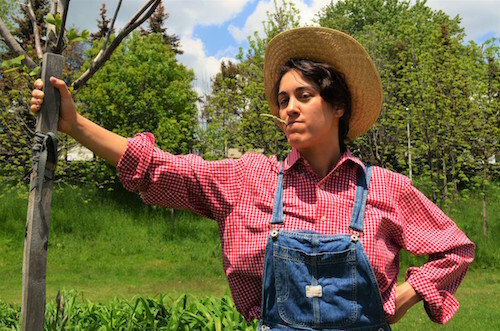 The Food Project, produced by Theatre By Committee, playing at the Toronto Fringe Festival, understands that it’s hard to talk about the convoluted ethical quagmire that comprises the choice of what we eat daily. After all, eating, they acknowledge, is one of the things we do most, and it’s one thing we can’t stop doing if we want to stay alive. It’s particularly hard to talk about this type of ethical choice without being didactic, the death knell of effective theatre everywhere. The actors, therefore, deliver their lecture with a wink, obviously aware that a show on this topic can never quite lose the aspect of well-meaning lecture. There are a lot of hard truths to digest here, but they’re sure portrayed as entertainingly as possible. Theatre By Committee is a young and earnest collective that is trying to explore the questions we might have about ethical eating while taking over the tiny Sketch Kitchen at Artscape Youngplace. The troupe makes good use of the very small space; we’re crammed in a couple of rows in front of the long counter, while they produce colourful props, dance, and cavort behind it (and sometimes atop it). The questions are embodied by a Toronto everyperson named Stevie, who is portrayed by each collective member in turn, and are addressed by a combination of songs, skits, and monologue. Each of these is filled with meta-commentary about the show itself and the choices they’re making in its presentation. Is this song parody of “Food, Glorious Food” from Oliver! too much? Is the lecture too depressing? Do we have time to address this tangential issue? A ton of information is imparted, all the way from the treatment of various animals to the environmental impact of avocado toast (there’s a relentlessly Millennial tone to the piece, but it’s still open and inviting). I felt a lot of this was pretty common knowledge, but I heard someone ask what a 100-mile diet was after the show, so clearly there’s a lot of explaining to do to the general (or even not-so-general) public. The cast effectively, but almost frenetically, establishes a wide range of amusing characters to impart this knowledge: there’s the cheerful farmer/actor doing a factory farm commercial that gradually devolves into horror, an angel with the voice of a hardbitten 1940’s news reporter who oversees the proceedings, a hilarious corn conspiracy theorist who darts into the audience bearing tinfoil hats, and irreverent singing vegetable puppets that are a little out of Avenue Q. We do need to learn about the abysmal treatment of dairy cows, the show implies, but there’s still time to laugh about cow farts, even if they’re destroying the earth. Everyone involved in the show is genuine and bright, which goes a long way toward smoothing out the occasional beat that doesn’t quite work or clunky line. They all have standout moments, with Owen Fawcett’s melodramatic cow/deadpan fish and Veronica Barron’s singing voice sticking in my mind. They bring this genuineness to a heartfelt discussion of each actor’s upbringing, whether their food experiences involved being one of a single-parent family of six living on food bank donations, experiencing fishing as a bonding experience in BC, or tending to cattle as part of 4H. The description of the various diets and adjustments they’ve tried adds a needed sense of nuance. Nothing is either simple or easy; there’s no “scape goat” to blame. It’s refreshing to hear the admission that it’s one thing to try a poverty-level budget for a week, knowing that there’s a safety net, and another thing to live it. They cheerfully explain their own failings, so we’re less likely to react defensively. Even though there’s not much we can consume without guilt, the show suggests that anything is better than the oh-so-tempting giving up. And, if your stomach is growling (or even if your stomach is recoiling at all this horrific information) there is a small, tasty treat at the end for sticking with it. Cruelty-free. Content Warnings: Audience Participation, Mature Language.